Welcome the Growing Like a Read program. To introduce you to what GLAR is all about, the Pioneer Library System has filmed and included a fun and informative video series for library customers. If you would like even more detail about GLAR, please take a look at the information provided below to learn more about the basics of this early childhood reading program. GLAR or Growing Like a Read is a project of the Pioneer Library System that promotes brain development for literacy skills in children from birth through age 4 through reading, talking, playing and singing. It was originally funded through a grant from the Inasmuch Foundation. GLAR is intended for parents and caregivers and their children in Cleveland, McClain and Pottawatomie counties. Day care providers receive special materials to work with groups. Children’s librarians at each Hometown Library will model GLAR rhymes and activities in story times, toddler times, Rhythm Babies, and Rhythm Toddlers programs. Research shows that it’s the one-on-one interaction between parent and child that is critical for early learning. Early reading has lifelong consequences. Research shows that children who enter kindergarten unprepared cannot catch up. 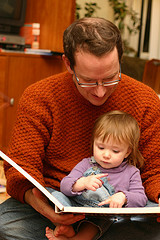 GLAR activities are suggested for any place parents and their children can be together: at home, on the go, at the library, in the store, at bedtime. Often! Because repetition is the key. The more often a beloved role model speaks, reads, or sings to a child, the stronger the neural pathways in the child’s brain become, the more words a child learns, the more sounds and rhythms of speech s/he can interpret, the more stories s/he understands and can tell, the more connections between words and print s/he can make, and the more s/he will be soothed and enchanted by books. Visit a Hometown Library and tell the Children’s Librarian you want to participate in Growing Like a Read. As long as supplies last, s/he will provide to each family: a tote bag to carry library books, a stand-up book of rhymes, songs and finger plays, an activity log matched to the child’s age, a copy of our nursery rhyme CD, and a copy of the PLS WORD Magazine explaining the program and the research behind it. This program is intended for all your children under age 4. You will receive additional activity logs matched to their ages. Day care providers receive a set of posters that correspond to the individual stand-up book. Contact your Hometown Library for a set for your center. Start today…and watch your children grow! Online registration will be coming soon for you to keep a log of books your child has read, see books other families are reading, track activities/skills, see upcoming children's events, and print activity sheets and a nursery rhymes book. Use these catalog searches to start your search for books based on each of the six pre-reading skills.